The Hybrid PV-Wind Power Plant (H-PVW) is a system capable to generate electricity from different renewable energy sources, typically photovoltaic (PV) and wind turbines. Hybrid Power Plant (H-PVW) is equipped with a Lithium (Li) battery energy storage system. The Hybrid Power Plant (H-PW) includes a Lihium (Li) Lithium (Li) battery energy storage system. The H-PVW can operate parallel connected to the main grid (on-grid operation), stand alone (off-grid operation) or connected to a micro grid, with other generators working in parallel (grid supporting mode). It is practical that the same H-PVW power plant can function in these three different modes of operation and that the suitable control strategy is either selected by an Energy Management System (EMS), or by the operator. The H-PVW inverter control allows to implement all these different modes of operation. Power control and energy conversion units are suitable for operation in enclosed housings (control and energy conversion cabinets). the DC series with DC inputs for the connection of photovoltaic solar power plants (PV), the second series to the connection with an AC energy source (e.g. mini hydro or wind turbine), and the third series for intermodal connections, DC and AC energy sources. The control and conversation cabinets have been conceptualised for indoor use, air-conditioning is available upon request. Thermal containers with control, conversation and battery subdivisions, and doors for service personnel are available in sizes from 20‘- 30‘ – 40‘ with nominal capacities from 20, 35, 70, 125, 250 kVA. 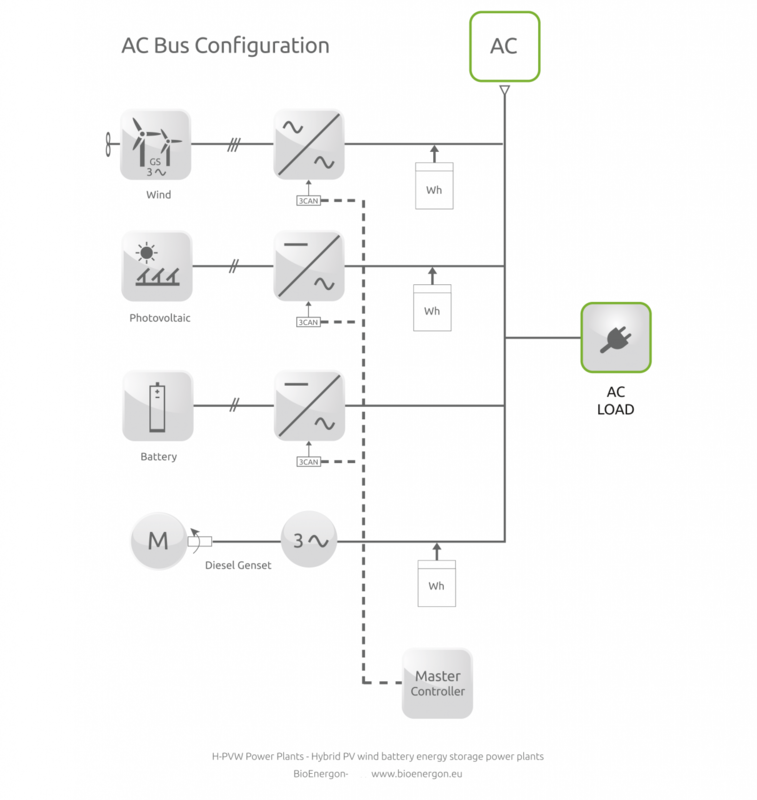 The AC bus configuration is preferred for High Power Hybrid power plants, with rated power more than 250kVA. It is suitable for on-grid and off-grid operation. The renewable sources are connected to bus through their power converters. In absence of grid, the battery bi-directional inverter can be operated by a “grid forming control”, which imposes voltage and frequency. The Diesel genset has a synchronizing controller which follows the (V, f) existing on the AC bus. The DC bus configuration is more indicated for H-PVWs with lower performance. The H-PVW unit, with single phase 230V 50/60Hz output voltage, adopts the DC bus. A H-PVW can connect a small Diesel genset to the AC inlet normally dedicated to the wind generator, so that a fully DC bus solution is created. 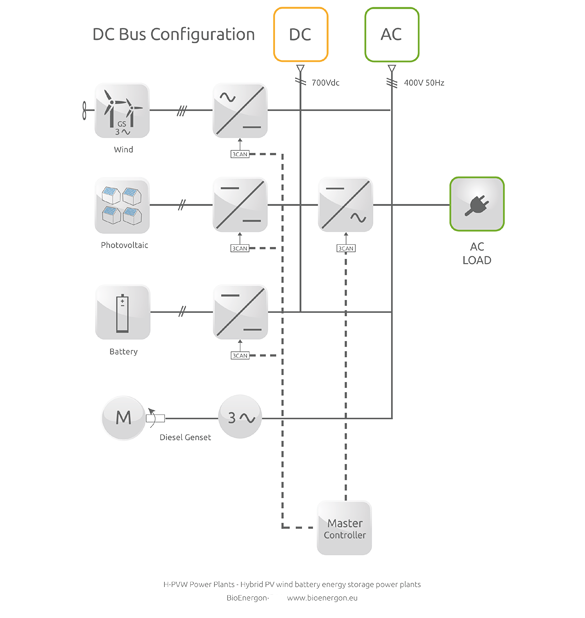 A fully DC bus configuration of H-PVW, with an inverter at the output, can work both on-grid or off-grid, using a “grid following” or “grid forming” control, respectively. The H-PVW is either connected to an isolated micro grid or it operates stand alone. It works as a Voltage Generator, the inverter control provides regulation of voltage and frequency, maintaining their values equal to the relative set-points, ensuring the power balance in the system. (Off grid operation). The H-PVW is connected to the main grid or to an isolated micro grid and it works as a Current Generator. The inverter control provides active power P and reactive power Q regulation. The inverter operates in synchronism to the micro grid voltage (which is established by the main grid, or by an inverter functioning in grid forming mode, or by a windturbine or diesel generating set) and it regulates the generated current to follow the P and Q set points (On grid operation). The generator is connected to the micro grid in parallel with other generators, its inverter control assures active and reactive power sharing through voltage and frequency regulation, by “droop control” (Micro grid operation). The PV generator can be operated in MPPT (Max Power Point Tracking) or in RPPT (Requested Power Point Tracking) mode. In MPPT mode the PV generator injects into the DC bus the maximum power available from the solar source; in RPPT mode it limits the solar generated power following the set point received from the EMS. 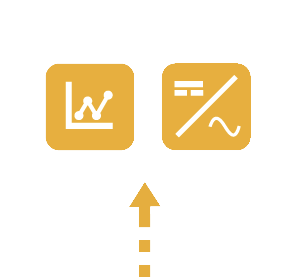 A simplified Energy Management System (EMS) is resident in the H-PVW controller and it governs the power flows in the H-PVW, optimizing the H-PVW operation according to general control functions. It can select the mode of operation of the inverter and it controls the transitions between the on grid and the off grid states. 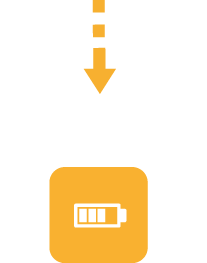 In off grid operation it continuously matches power generation with load demand and controls the state of charge of battery. The H-PVW systems can operate in connection with an external controller, where a more complex EMS can be implemented, capable to manage applications involving more generators.